The Palestinian Prisoners’ Society (PPS) has reported that Israeli soldiers have abducted overnight and at dawn Wednesday, seventeen Palestinians, including a woman who is also a former political prisoner, in different parts of the occupied West Bank. 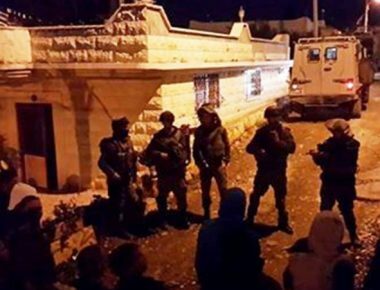 The Bethlehem office of the PPS said the soldiers invaded and ransacked many homes in Husan and Beit Fajjar towns, and abducted five Palestinians identified as Ghassan Mohammad Hamamra, Abdullah Tareq Shousha, Hmeidan Mahmoud Taqatqa, Hatem Mahmoud Taqatqa, and Yousef Ahmad Taqatqa. The soldiers also invaded many homes in the central West Bank governorate of Ramallah, and abducted Naji Ali Rimawi, Nazzal Omar Abu Kharma, Fadi Zeebar and Mohammad Mahmoud Barghouthi. In Hebron governorate, in the southern part of the West Bank, the soldiers abducted three Palestinians, including a woman, who is also a former political prisoner, from their homes in Doura and Yatta towns. They have been identified as Osama al-‘Amour, Mo’men Jamal Abu Hawwash and Sojoud Saleh Daraweesh. In Tulkarem, in northern West Bank, the soldiers abducted Hazem Nidal Sabri, Nihad Mdallal, and Sobhi Khalaf. Another Palestinian, identified as Nassar Dahbour, 34, was abducted in Azzoun town, in the northern West Bank governorate of Qalqilia, while Mahmoud Jaber was abducted from his home in Shu’fat refugee camp, north of occupied East Jerusalem.